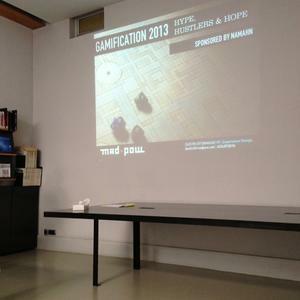 On Friday 27 April I attended Dustin DiTommaso’s (Mad*Pow) `Beyond Gamification: Designing Behaviour Change Games’ workshop at Namahn. In this workshop we explored how game design principles could be used in the field of interaction design (and the development of behaviour change products/services in particular). And how gameful designs might even help improve environment ecology, sustainability and prosocial behaviour. In this hands-on worskhop we learned to incorporate behavioural change psychological techniques into our game designs. We looked at how capablity (skill, knowledge, planning), motivation (awareness, social approval and support), opportunity (triggers), competence, autonomy and relatedness affects behaviour. This resulted in 5 playful designs aimed at helping users achieving personal goals such as health or saving money.